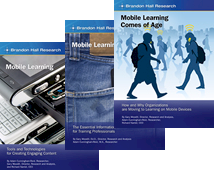 Check out these three reports published today to help you go mobile by Brandon Hall Research. Perhaps you've been sitting on the sidelines waiting for proof that mobile learning isn't just a fad. The reality is that new mobile learning initiatives are making the news daily. If you aren't using mobile learning today, you probably will be tomorrow. A new report out yesterday, from the Brown Center on Education Policy at the Brookings Institution. 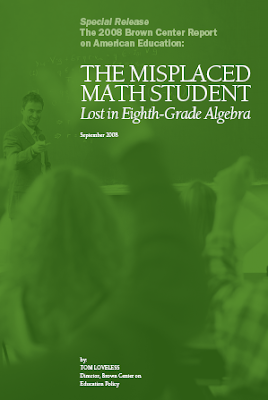 The report by Tom Loveless finds that the nation’s push to challenge more students by placing them in advanced math classes in eighth grade has had unintended and damaging consequences, as some 120,000 middle-schoolers are now struggling in advanced classes for which they are woefully unprepared. "The ‘democratization of algebra’ sounds like a worthy goal – it certainly stems from good intentions," says Tom Loveless, the Brown Center’s director and author of the new study, which is being released as an advance excerpt of the 2008 Brown Center Report on American Education. But, he adds, "when a large number of students who don’t even know basic arithmetic are placed in classes with students several grade levels ahead of them, the result is false democratization. That’s bad for the misplaced students, and it’s bad for their well-prepared classmates too." The full report will be published in December 2008. Here's what's new on T.H.E. Journal's site today. 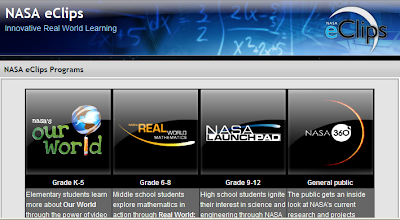 NASA has launched a new online digital media service to foster science education in the 2008-2009 school year. Dubbed "eClips," the new service offers short, on demand video clips focused on space science and engineering, along with environmental sciences. eClips is a partnership between NASA and YouTube, Internet Archive, CaptionMax, and the National Institute of Aerospace. NASA eClips currently includes 55 individual five- to 10-minute sceince-focused video clips. College officials nationwide are concerned about the number of recent high school graduates in need of remedial math courses, and some schools have turned to free online programs that could preserve shrinking operating budgets. The "Making the Grade, Version 3.0" study was conducted by Pearson, a company that specializes in digital curriculum for pre-kindergarteners through college-age students. Pearson also is the creator of MyMathLab, a free online math program designed to help students in college math, including remedial courses. In art, as in life at large, technology has changed everything – or, more precisely, almost everything. In art classes at schools and universities today, new and emerging software is rendering art appreciation and even actual artistic production accessible to a far greater number of interested students and aspiring artists than ever before. Research indicates that low enrollment rates of young women choosing engineering as their major have led to dwindling numbers of women entering the profession, suggesting that high school girls don't perceive engineering as relevant to their educational or professional goals. Now, a new national campaign--called "Engineer Your Life"--intends to change that. Since the Trendalyzer development was taken over by Google the Gapminder Foundation maintain the same aim and uses Trendalyzer and its resources to produce videos and web service showing major global development trends with animated statistics. On the Gapminder website, visitors are reminded to mind a variety of gaps, whether they be in income inequality or quality of health care. This rather absorbing website was created as a non-profit venture to promote "sustainable global development and achievement of the United Nations Millennium Development Goals by increased use and understanding of statistics and other information." The site makes use of Trendanalyzer software to offer visualizations related to questions that include "Which country has the best teeth in the world?" and "Who gets what: Farm subsidies". Learning 2008 - "All About Learning"
"Making The Grade" includes 20 data-driven case studies that show how MyMathLab and MathXL have changed the way math is taught and learned at schools across the U.S.
Each case was written by faculty or instructors and discusses the student results they have observed over time. 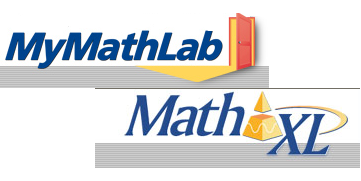 According to the report, instructors who required the use of MyMathLab or MathXL experienced higher retention rates, higher pass rates, and/or higher subsequent success rates. These changes are especially meaningful for remedial and prerequisite math courses, and can help ensure that students who previously constituted the largest percentage of drop/fail/withdrawals not only stay in school, but graduate having mastered important concepts. The report illustrates the consistently positive impact that MyMathLab (MML) and MathXL (MXL) have on the quality of learning and cost reduction in higher education math instruction. It examines how MML and MXL can be successfully implemented in any environment--lab-based, hybrid, distance learning, traditional--and demonstrates the quantifiable difference that integrated usage of these products has on student retention, subsequent success, and overall achievement. Tech & Learning's September 2008 Issue is online now. Looking to freshen up your credentials but don't have the time to do the grad school thing at night? See which universities award real sheepskin for virtual degree programs. Many students feel they get more interaction with both professor and peers in the online format, as the flexibility of an unlimited connection isn't restricted to a once-a-week two-hour session. A number of traditional universities now offer online options, which can make sifting through the long list of offerings intimidating. Here are highlighted some of the top programs in this article. The newsletter is now available also in Bulgarian and Romanian. To update your language and newsletter settings please login on the portal and access “My profile”. The eLearning Papers seeks articles on digital literacy. The papers should address topics such as learning and social (e)inclusion, information literacy, new e-skills and lifelong learning, etc. The deadline for article submissions is 10 November, 2008. The selection 2008 of Comenius, Erasmus, Leonardo da Vinci, Grundtvig projects under the Lifelong Learning programme (DG EAC/30/07) has been published. Active Ageing and the Potential of ICT for Learning. The report, published by the IPTS, argues that ICT have an important role to play in developing learning opportunities for older people in an ageing society. It concludes that holistic policies are needed to support learning opportunities in ageing societies, enabled by ICT. eureleA – EUROPEAN eLEARNING AWARD. The competition selects the best-practice projects in eLearning for job training and further education. 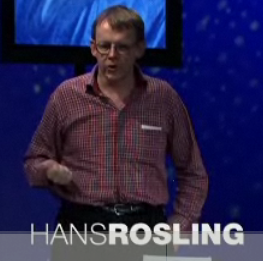 Submission closes on 20 October 2008. ICT 2008, 25-27 November, Lyon, France. The Europe's biggest research event for information and communication technologies is organised by the European Commission and hosted by the French Presidency of the European Union. The FoCus project aims at fostering synergies between public policies in support of eBusiness for SMEs. The final conference will be held on 29 September 2008 in Brussels. iTEC08, 6-7 November, Darmstadt, Germany. The new ICT-congress for enterprises presents the latest international trends in information and communication technologies as well as the most important trends. The congress includes also the award ceremony for the European Innovative Games Award. ePORTFOLIO and DIGITAL IDENTITY 2008, 22-24 October, Maastricht. This year’s key thematic conference celebrates the increasing level of international ePortfolio implementation for the enhancement of the personal learning environment and organisational, community and territorial learning. Principal themes include ePortfolio research, interoperability and ePortfolios for regions, healthcare and employability. Registration is now open. iLEARNING FORUM 2009, 19-20 January, Paris. Calls for contributions are now open for this international bilingual Conference and Exhibition, this year expanded with the addition of a conference dedicated to the Recognition and Accreditation of Competencies (RAC). The theme of this year's iLearning Forum is 'Integrated learning: embedding learning technologies for individual and organisational development'. Subash Bijlani, professor of practice, business and executive programs, University of Maryland University College, USA, has students from as varied backgrounds as possible — from a 60-year old grandmother of a home-run enterprise to a businessman wanting to do his second MBA. Bijlani is a great advocate of ‘asynchronous learning’, a concept that began to be talked about in the late 1990s. According to Bijlani, asynchronous learning is the best way of upgrading knowledge without making drastic changes in lifestyle or routine, and without the stress of sitting through competitive exams. He is President of Magnus Engineers Pvt. Ltd., engaged in management consultancy and education & training in the fields of technology, operations management, business development, quality, and intellectual capital development and management. He was earlier with the British MNC, Molins PLC, for some fifteen years as the Managing Director and CEO of their Indian subsidiary. He has served on the Boards of Governors of the Council of Scientific & Industrial Research and a number of companies and academic institutions in India. Subash graduated in Mechanical Engineering from the University of Manchester Institute of Science and Technology, UK. He also holds postgraduate Diplomas in Computer Management and Finance. He is a Chartered Engineer and a member/fellow of a number of professional and learned bodies in India and abroad. 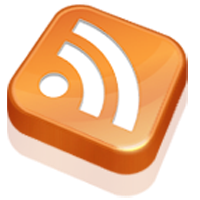 Jennifer Rausch, Atomic Learning, Inc. has been in touch to reminds us about the following event: a limited-time complimentary workshop on Web 2.0 in the classroom. The Seven Steps to a Flat Classroom workshop was created by Vicki Davis, recognized Web 2.0 expert and creator of the Cool Cat Teacher blog, for Atomic Learning. In the Seven Steps to a Flat Classroom workshop, Davis herself utilizes Atomic Learning’s short, show-and-tell video tutorials to guide users through flattening their classroom by expanding it to include global communities and collaboration tools. The workshop is a valuable resource for educators seeking to integrate technology and includes over 80 tutorials on topics such as Applying ISTE NETS standards to your project, Connecting Classrooms online, Digital Citizenship and Safety and many more. 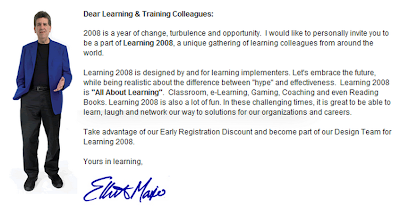 Atomic Learning, Inc. was formed in 2000 by a group of technology educators with a mission to create useful and affordable online products focused on teaching people how to effectively use technology. Atomic Learning delivers a library of thousands of short, easy-to-view-and-understand tutorial movies that can be used as an integral part of a professional development program, a valuable curriculum supplement, and an anytime/anywhere software training resource. Atomic Learning now serves more than eight million users and 12,000 school districts and universities in all 50 states and over 45 foreign countries, as well as individuals and organizations in a variety of other industries. Seven Steps to a Flat Classroom - Workshop file(s). Bill Fitzgerald, of FunnyMonkey, has written Drupal for Education and E-learning, expected from Packt Publishing October 2008. Social media in the classroom provide unique opportunities for teaching and learning. This book helps you break through the hype, and shows you how to build a site in Drupal that incorporates the Web in your class, on your terms, to achieve specific learning goals. 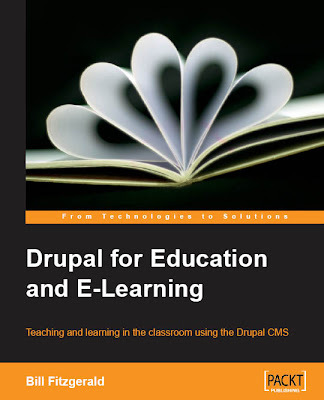 The book focuses around creating educational activities in Drupal, with lots of examples of realistic courses and classroom ideas – and how to implement them. I could not have been written this book without the support and help of fellow primates Marc Poris and Jeff Graham. Also, Peter Wolanin and Michael Peacock, two of the technical editors, gave me some great feedback that helped during the revision process. He was born in 1968, and worked as a teacher for 16 years. During that time, he taught English and History, and worked as a Technology Director at the K12 level. Bill began using technology in his own teaching in the early 90s; from there, he moved on to database design and systems administration. During that time, Bill began developing strategies to support technology integration in 1:1 laptop systems, and in desktop computing environments. In 2003, Bill and Marc Poris founded FunnyMonkey, a Drupal development shop working primarily within education. Bill started and manages the Drupal in Education group on http://groups.drupal.org/, and is active in various educational and open-source communities. 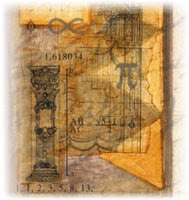 Bill blogs about education and technology at http://funnymonkey.com/blog. U.S. schools must teach 21st-century skills for the nation to be globally competitive, it says. Creating a 21st-century education system that prepares students, workers, and citizens to triumph in the global skills race is the central economic competitiveness issue currently facing the United States, according to a new report from the Partnership for 21st Century Skills (P21). The report provides a sobering wake-up call for the nation's civic and education leaders. The report, called "21st Century Skills, Education, and Competitiveness," argues that for the United States to be globally competitive--and for states to attract growth industries and create jobs--the nation requires a fresh approach to education that recognizes the critical role 21st-century skills play in the workplace. The National Science Foundation's Multimedia Gallery features nearly 100 videos and webcasts on a wide range of science topics, including a fossil that might represent the first vertebrate to emerge from the sea; turning forest-industry waste into fuel and textiles; "superglue" produced by aquatic bacteria; a house built on a "shake table" (earthquake research); teaching robots to swim; 14 engineering challenges for the 21st century; solving a crime scene mystery; a 60-second history of the universe; earth's deep-time archives; dinosaurs; and more. 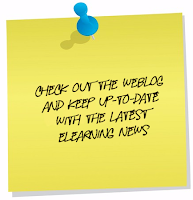 Top Story from eLearn Magazine!